Two weeks ago we published Tim Flagler’s excellent video on how to use a Whip Finish Tool (watch “How to Use a Whip Finish Tool“). 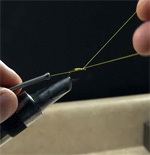 But what if you don’t have a tool handy and still want a perfect finish for your flies? The answer is in this week’s video on how to complete a whip finish using only your hands (and a bit of dexterity).